The traffic was backed up on the A505 to way above the Charlton turnoff. Vehicles were bumper to bumper, inching their way between the last fallow fields before the outskirts of Hitchin. There was little prospect of the jam dispersing for at least 10 minutes. I glanced in my rear-view mirror. The heads & upper shoulders of the driver & passenger in the car behind (a green Metro with a 2006 licence plate) were framed in its letterbox screen, both figures motionless, both staring abstractedly ahead. They were two young women. The driver was pale & oval-faced with a high forehead from which the black hair was scraped back into a ponytail. The passenger was also pale, her red hair falling loose. Something in the fixity of her stare kept me watching her: the stiffness of anger or grief. The driver looked sideways at her companion. For a few moments the two faces were perfectly balanced in the centre of my mirror, the one full faced & gazing forward, the other in quarter-turn profile. Then the driver spoke – a single word, it seemed. The passenger made no response. The driver spoke again – the same word - & after a few seconds delay the passenger smiled. It was not a smile of pleasure: I watched it form & where the one corner of the mouth lifted, the other turned down. The eyes – blue or grey? – blinked rapidly & across the distance I sensed tears falling. The passenger said nothing & her head remained still, erect & facing forward. The traffic edged forward onto a brief gradient flanked by the first houses – detached villas built, I would guess, in the 1930s. I looked again. Both faces were framed as before in the windscreen of their car, in the rectangle of my mirror, gazing forward. Then the driver turned her head slowly to her right as if to study the variegated houses, each customised by its front door, its curtains & blinds. Her shoulders lifted in what seemed to be a sigh: her head tilted back slightly & her eyes moved restlessly across the fascia of the house immediately across the road from our two cars. Then slowly she closed her eyes & raised her hand to her forehead, cupping it gently, the fingers still. Without turning her head the passenger began to speak rapidly, her face unanimated by emotion but her mouth clearly enunciating a torrent of words, fluent & unstinting. 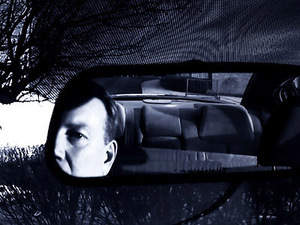 The driver made no attempt to interrupt, her face motionless, her eyes seeming to meet mine inside my rear-view mirror. I turned my head slightly but continued to watch. The passenger stopped talking, her lips compressed, her eyes unblinking as she stared through the windscreen. The driver turned her head towards the passenger & her lips formed a word. “Please”, she said. Then again: “Please”. Each time she nodded the word forward in emphasis. The passenger’s face was impassive, its mask-like stillness unyielding. The traffic moved forwards, picking up a little speed, the gaps between vehicles increasing. As I crossed the stream of traffic feeding into Upper Tilehouse Street from the Pirton Road fork, a lorry moved into position behind, blocking my view. The jam cleared at the Stevenage roundabout & I drove down into Tilehouse Street & swung into the filling station for petrol & a couple of sandwiches for lunch. Further blockages delayed me alongside the common & it was some 10 minutes before I was able to join Walgrave Road & a clearer route. As I drove past the Kwikfit tyre centre, a flash of green in the other lane caught my eye. It was the green Metro. The driver was alone.